The heli-fondue experience starts off with an exhilarating helicopter flight over Panorama Mountain Village on route to the Summit Hut. After landing, enjoy beverages on the patio or beside the crackling fireplace. 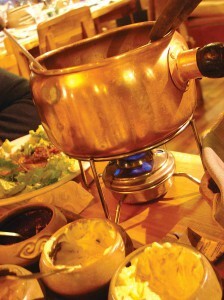 Take in the amazing views while you await Perfect Cheese and Chocolate Fondue. Your family or colleagues will savour this alpine tradition.